A month ago SAP released a testing tool for SAP PI/PO. One thing I have been contemplating a lot is how to test the first upgrade. 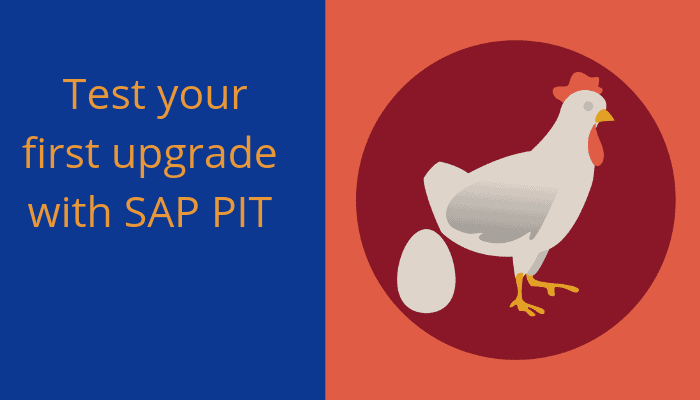 One challenge with the SAP PIT testing tool is to be able to run a test on your first upgrade with the tool. I do see a problem with the first two upgrades. If you accept the premise that we need to test all upgrades for SAP PI/PO and therefore need a tool for it. Then it has some challenges for the beginning. Implement the patch according to the note on your development system. Once the note is in production you can upgrade your development system to 7.5 SP 14. Then you can start to create test cases on the 7.5 SP14 and validate that nothing has changed. You will then compare production data with data on SP14 so you cannot compare how the upgrade works. For me it does sound like a lot of extra manual tests and changes to your landscape limiting how much you can do in the process. The Figaf tools allow you to test all SAP PI 7.31, 7.4 and 7.5 system without installing new support packs. We have a number of options to record messages. Either as SAP is doing with looking in the log messages, except we can use a patch that is 2 years old to enrich your monitoring web services. Or we even have a web scraping option that is even older than it. But we do have a better solution which is to add a module to your processing chain. That way you can test much faster on your system with a lower impact on them. We do hope that we are proving enough value together with ways to make your SAP testing better and faster, and also allow you tigth itnegration to test the interfaces that you are changing. It is a pretty simple just process. Once you have a Testing Template in Figaf IRT and have run it you will see the Export to PIT button. The messages then exist on your SAP PI system. Figaf IRT will create a Test Suite in PIT with the same messages. IRT know which messages should be added to the test cases so it will request. Then it is just up to PIT to fetch the messages. It is a licensed feature of the Figaf IRT so you will need to purchase a license, it can save you some time for your testing. Update it the process if PITs API is changing since it is not published. There may also come future development in the PIT tool, we can use to run this process better. Lets see in the next support packs. It is possible to add running of tests cases and integrate it with our DevOps appoach so you can test the interfaces that is changed by a mapping. If you want to see how fast you can create test cases in Figaf and run your tests in it then download the tool for free and get started in an hour. We do also have many extra features that you will not find in SAP PIT. Updating a SAP PI/PO system, what to think about.